We are manufacture of toilet brush single hockey and double hockey and round brush with stand. Our clients can avail from us a wide range of Toilet Brushes that are extensively demanded by our customers for their excellent durability, smooth bristles and superior finish. Offered in different sizes, shapes and colors, these toilet brushes have the front end loaded with adequate amount of plastic bristles to ensure proper cleaning. 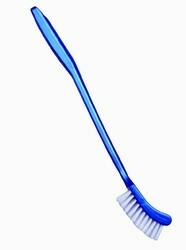 Moreover, the curve at the head of the brush provides better reach to the corners of the toilet that are otherwise difficult to reach with a normal brush.